MULTIPLE OFFERS HIGHEST & BEST BY 03-26 AT 5 PM. THIS SYRACUSE HOME HAS EVERYTHING YOU NEED! 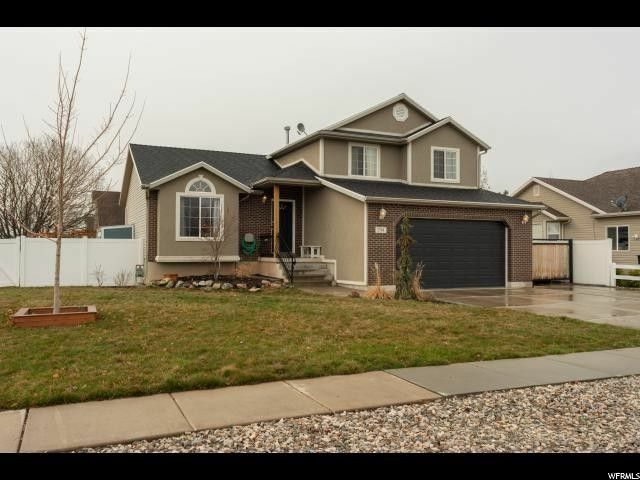 The curb appeal is BEAUTIFUL and located on a corner lot in a cul-de-sac with Mountain Views. It has 5 bedrooms, a formal living room , large family room, 2 full & 1/2 Baths and a HUGE CRAWL SPACE you have got to see to believe! It is currently a play room. Plenty of parking which includes RV parking. There are MANY gorgeous custom built features throughout which include the front porch railings, interior railings and custom doors and the cutest dutch door entering the playroom. The Master Bedroom has french doors , a bay window, walk in closet and an on suite with double sinks, a separate shower and soaker tub. If you love to spend your time outside then you will definitely enjoy the back yard which boasts a detached GORGEOUS CUSTOM BUILT PERGOLA & DECK , a patio, custom play gym , tall garden boxes, a LARGE shed, a separate new SHE shed and several different types of apple trees. In addition to all of the the PRETTY features, you will be happy to learn that the AC is BRAND NEW and the carpet in the basement is only 2 yrs old. You will find that this home is in move in condition and ready to enjoy. Square footage figures are provided as a courtesy estimate only and were obtained from the county records . Buyer is advised to obtain an independent measurement.